Take that, Black Bart* ... er ... Frustrating Flower! 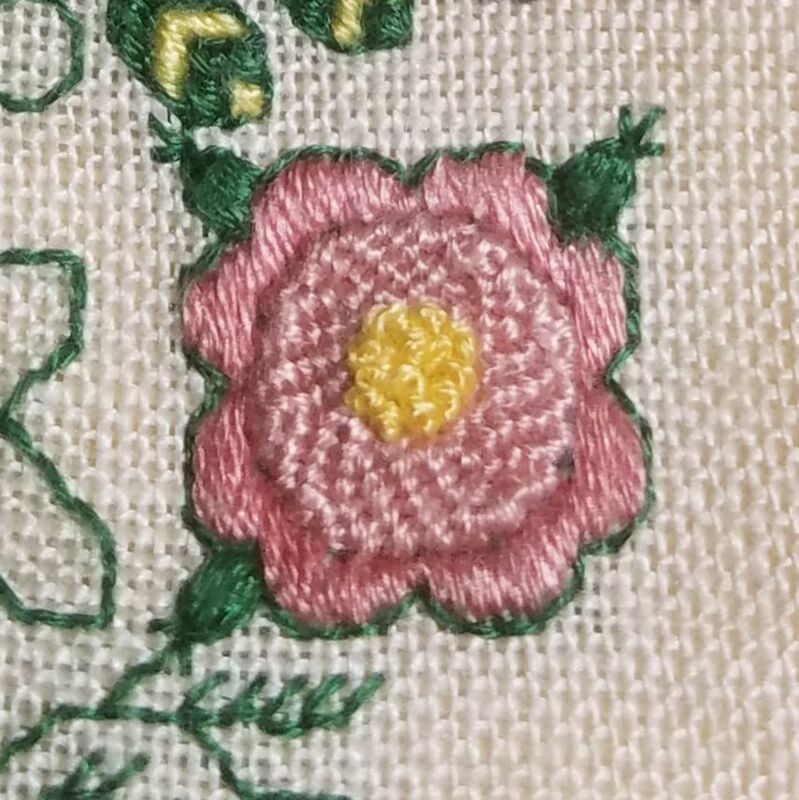 I did try the ring of chain stitch to anchor the spiral trellis part back to the fabric, but like previous efforts, it looked sloppy/messy/bad so I just tacked the inner edge in three or four places with the same color thread. Center is filled with Colonial knots (which took me far longer than I'd have liked to figure out again as all the diagrams I could find were for right-handed stitching). Worked on outlining the Lady's dress some last night. This band has so much in it, it's hard to decide just which bit to work on next! * In my family, we say "take that, Black Bart!" to convey the idea "I've succeeded, so there, ha!" But I have no idea where the phrase came from or why we say it. Wonderful Husband doesn't recall either. But for the curious, apparently Charles Earle Boles, aka Black Bart, was an outlaw remembered for poetic messages he left behind at two of his many robberies. He had a reputation for style and sophistication and robbed stagecoaches in and around northern California in the 1870s and 1880s (thanks, Wikipedia). Very interesting on Black Bart! I love family sayings. 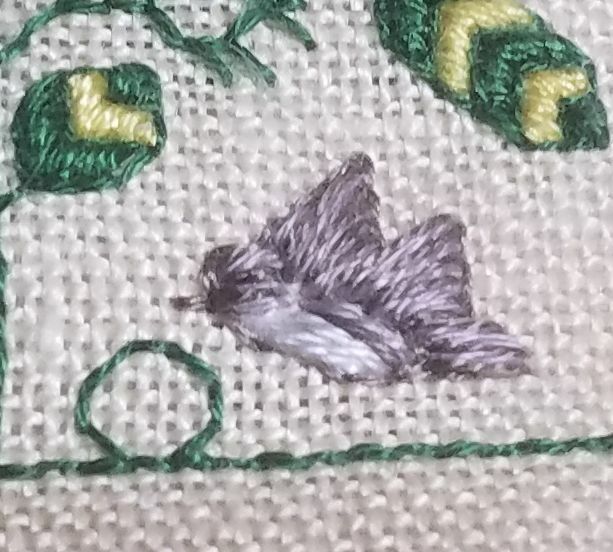 :D Your stitching looks wonderful as always. Glad you got everything looking how you want it. I remember Black Bart, I think there was a series too, not sure. The flower and birds look great! Your flower is absolutely beautiful--I am in awe. "Take that, Black Bart" came from a movie, but which one I have no clue. My father used to say it, too. The flower is perfectly lovely....job well done! The flower is wonderful, so pretty as are the birds. I didn't know you are a left-handed stitcher, it must make some of the stitches trickier and buying nice embroidery scissors very difficult. I love Google and Wiki for all sorts of research. According to my son my most common phrase is "I'll Google that..."
Those flowers and birds are looking great. 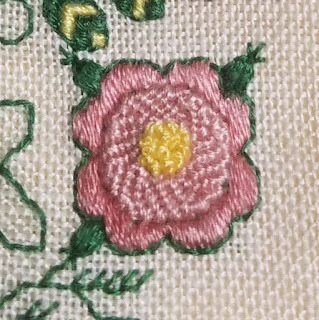 Very interesting stitches on the flower. Happy fall--isn't this October weather amazing?! Love how you have done the birds and the pretty flower. perfect.